The Rescue Positioning Device (RPD) is designed to perform as both a work positioning device and as a personnel rescue device. Along with raising and lowering capabilities, the rope in the device can be locked into place so that the user can be positioned in a precise location for work purposes. 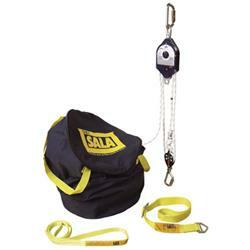 The simple raising and lowering mechanism makes the RPD ideal for use when rescuing personnel. The device can be used by rescue teams, utilities, window washers or any other application that call for a work positioning device. Unlike many industrial rope access rescue systems, the RPD is easy to operate allowing everybody to use it, no specialized rescue skills are required. The device comes pre-rigged, it can be simply removed from the bag, installed and used quickly and efficiently. The user can raise and/or lower him/herself for self rescue or an attendant can remove the person from immediate danger until professional medical treatment or rescue support has arrived. Compliance/StandardsANSI Z117.1-1995, OSHA 1910.146, Capital Safety Gen. Mfg. Req.